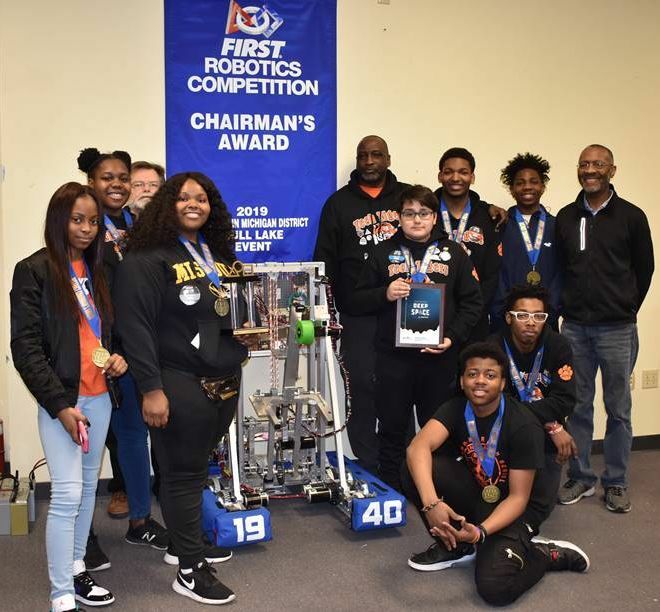 Benton Harbor High School's Robotics team members - the Tech Tigers - were up early to tell Rotary about their recent experience at the Gull Lake First Robotics competition. The team is shown in front of a banner declaring them the Chairman's Award winner for the 2019 Gull Lake District. The award cited the team's efforts to "Transform the culture of their community in ways that will inspire greater levels of respect & honor for science and technology". The team was recognized for its efforts in health and safety. The Tech Tigers are only the second team from SWMI to win the award. The award automatically qualifies the team for the next round of competition. Shown above on left of banner are Amiya, co-captain Deyisha, coach Delbert Patterson, and co-captain Tamia; on the right, the back row, from left, Coach Shannon Harris, Gerson, Daniel, and lead mentor Joseph Taylor, in front are Karl, Kenneth and Antwon. Not shown is Jacobia. The team thanked Benton Harbor Sunrise Rotary for being a sponsor.